Model H9395 is one of our High Power, 180° Hybrid Combiners/Dividers. Covering the full 350-1000 MHz band, and rated at 250 W CW, this robust design operates with minimal insertion loss, 0.3 dB Max., and 20 dB port-to-port Isolation. Measuring just 3.5 x 2.48 x 1.06", the H9395 is compact, and ideal for military and commercial applications. Model H9395 is one of our High Power, 180° Hybrid Combiners/Dividers. 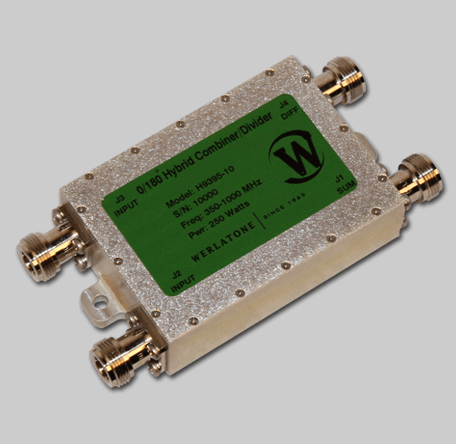 Covering the full 350-1000 MHz band, and rated at 250 W CW, this robust design operates with minimal insertion loss, 0.3 dB Max., and 20 dB port-to-port Isolation. Measuring just 3.5 x 2.48 x 1.06″, the H9395 is compact, and ideal for military and commercial applications.